If you’ve had a crown at Complete Family and Aesthetic Dentistry in the last year, you’ve probably heard us talk about sending your crown to my “boyfriend’s” lab. I’d like to take this opportunity to clear up any rumors that I may have started, as well as brag a little bit about the advanced education that I am receiving at Spear Education. 2. This weekend I was honored and humbled to be trained by my “boyfriend,” Dr. Bob Winter. Dr. Winter has designed several of the burs that I use on a regular basis and has been involved with research and development of some of the most advanced dental materials used today. 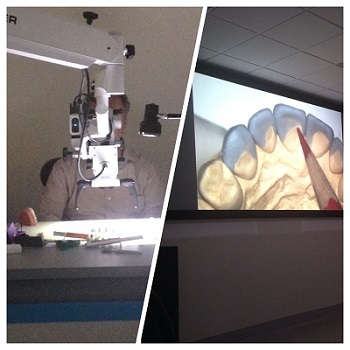 His ability to see and teach dentistry through the eyes of both a world renowned Prosthodontist and an exquisite lab technician have been a game changer for many dentists. 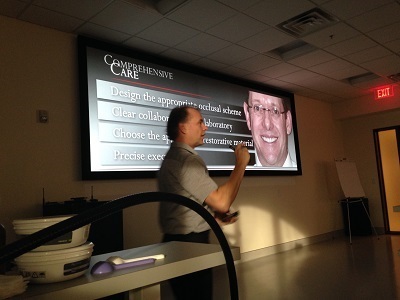 I spent three days this weekend working hands-on with 30 of the most advanced dentists in the world, learning about complex lab work and the practical application of advanced anterior restorative dental techniques. The facility is way cool– Dr. Winter would be working on something in the microscope and it was projected so what we could see the details of each case. Have you ever seen a front tooth that just doesn’t look right? Frequently this happens as a result of improper preparation design or poor material selection. I’d like to help you or a loved one get the smile you’ve always wanted. Give us a call for a complementary Aesthetic Consultation. We look forward to hearing from you!